Pumpkin pie is one of my favorite autumn and winter desserts. Sometimes I make sweet potato pie instead, if the Southern is coming out in me that day. But I make pumpkin when the Pilgrim genes are coming out (my paternal grandfather's people came over from England on the Mayflower). Usually I just make a regular unbleached flour crust, but I had a special request from a friend who is seriously gluten-free. She's tried a few recipes that weren't entirely satisfactory in one way or another, so I set out to develop one I hope will please her. If you want to make regular pastry, rather than gluten-free, go to my Pecan Pie post. 1 Make pie crust as directed below. Preheat oven to 450 degrees. 2 About 10 or 15 minutes into the oven preheating and pie shell resting in the freezer, make pie filling by mixing the above ingredients in the order given in medium bowl; I use a 2-quart glass measure. 3 When oven is ready, remove pie shell from freezer and pour in the pie filling. As soon as you put it into the oven, reduce the temperature to 425 degrees; bake pie for 15 minutes. Reduce heat to 350 degrees and continue baking for 40 to 45 minutes or until knife inserted near center comes out clean. After you've made pumpkin pie a few times, you can tell just by looking whether or not it's done. It should be fairly firm but still have a little jiggle left. 4 Cool on wire rack for 2 hours, then refrigerate for at least 3 hours. Serve with softly whipped cream. I sweetened and flavored 1 cup of heavy whipping cream with 4 teaspoons of real maple syrup and 1 teaspoon of vanilla extract. 2 In 1/2-cup measure, combine lemon juice or vinegar and ice water. Pour over all of flour mixture; pulse for six 1-second pulses or just until dough forms large clumps; do not over-process. 3 Do not refrigerate dough at this point as I do with regular all-butter pie crust. Turn dough out onto lightly floured (gluten-free, of course) surface--a piece of plastic wrap makes it easier. Form dough into a round disk, sprinkle lightly with gluten-free flour--topping it with another piece of plastic wrap makes it easier--and roll out to 12- to 13-inch circle. Transfer to Pyrex pie plate that has been sprayed with cooking spray. Crimp the edge in your favorite way, then pop the pie plate into the freezer while you prepare pie filling. Cuisinart DLC-2009CHB Prep 9 9-Cup Food Processor, Brushed Stainless and other currently available models. I wish I had some pumpkin puree ready for this flawless autumn pie! It looks totally my type of dessert. Excellent! Thanks, Angie. Though you can use homemade pumpkin puree--and I have--I actually prefer the canned. And it's not often that I prefer the canned version of anything. That's some pretty pie! Is the pie crust in the picture gluten-free? It looks just like regular. Kerry, thank you! Yes, the crust in the photo is the same crust as the recipe. It's a little more crumbly than regular pie dough but rolls out pretty much the same. Thanks so much, Erin! I'm really working at my photography (with a very limited little camera) so really appreciate the compliment! Be sure to make the pie and give Samantha a little taste of the filling. The pie looks delicious. I haven't tried sorghum flour, and usually stick with the white rice/tapioca/potato combination. I'll have to branch out a little into the sorghum field! Thank you for commenting on my 'smoking' post. I am sorry to hear that your mom died at such a relatively young age. How profound that you made a conscious decision at age four not to smoke. That's just amazing, isn't it. It's been interesting and sad to read the comments of those who've watched loved ones die from the effects of smoking, and how it affected their own lives. Thanks again! Thanks, Judy. I've been using a similar combination to yours for several years, only with brown rice flour. I think I like the sorghum flour even better. Note: You can also use fresh pumpkin, if you have it. Just peel and cut into chunks and steam or roast until tender (about an hour at 350 degrees) and puree in food processor or blender. 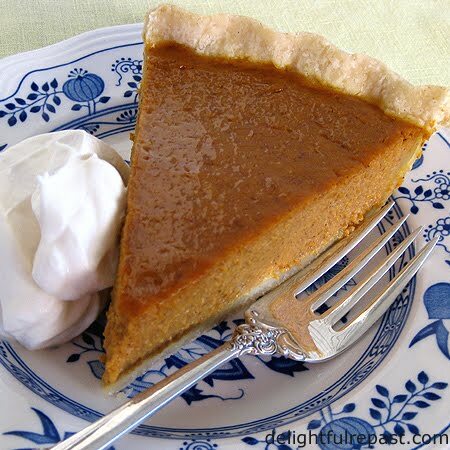 Funny thing, though, I actually prefer the taste and texture of pie made with canned pumpkin! Love the look of this pie, we don't often have Pumpkin & Sweet Potato pies here in Australia, not sure why really because they're wonderful. Thanks, Anna. Yes, they are wonderful but for some reason aren't as popular in other countries as they are here. And it seems some places, like Norway, don't have them at all. Good solution to keeping your crust stuck together without the any of the gluten of ordinary wheat flour. Thanks for stopping by, Peter. I post the occasional gluten-free recipe. More and more people are going GF these days. The pie looks gorgeous Jean! I love coming to your site with all the gluten free recipes.. I need to start cooking/baking gluten free a little more. Thanks, Jenn. I enjoy developing gluten-free recipes now that I have several GF friends. Jean, I made an apple pie with your recipe and it turned out great! I only veered from your advice when it came to pulsing the flours and mixing in the butter. I found that 6 1-second pulses didn't do the job. For me, it was more like 40 pulses. I plan to use this recipe for Thanksgiving. Jo, you are so welcome. I'm glad you liked it! The number of pulses required depends on what kind of food processor you have and how fast or slow you count. :) Apparently, you figured out the right number for your machine and counting speed. Hope you all enjoy the pumpkin pie.